VPIP and PFR go together like peanut butter and jelly, which is why you’ll almost always see the stats side by side like 25/17 or 30/10. But why exactly is this helpful? So whereas VPIP on it’s own will tell you whether a player is tight or loose, their VPIP/PFRwill tell you if they are passive or aggressive. Therefore, these two stats will give you a good idea of your opponent’s playing style. The PFR (Pre Flop Raise) stat is a decent stat on it’s own, but it really comes in to its element with you compare it to the similar VPIP stat. This is why I covered how useful it is to combine the two in this guide, rather than dedicating the whole article to the PFR stat alone. Thanks to VPIP/PFR, you really start to get a picture of what a certain player is like when you can see the proportion of the time a player is raising when they actually enter a pot. Every HUD and a large portion of strategy threads use VPIP and PFR, so it’s worth familiarising yourself with these stats early on. Examples using VPIP and PFR. No-Limit Holdem, full ring table, you are in late position holding AQo. 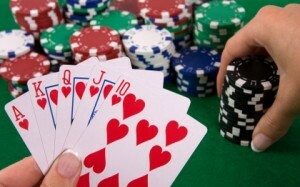 Everyone folds to a player in middle position who raises 3 times the big blind. You look at his stats (we assume a large enough sample is available). a) VPIP=34 / PFR=8, positionally aware with PFR=6 in middle position. Obviously a very loose player preflop, but he raises only his strongest hands. So, his current range is AA through 88, AK, AQ, AJs, ATs. Where do we stand? We’ll dominate him 10% of the time – against AJs and ATs (0.6% of total hands), we’ll split it 50% of the time when he’s got AQ or the coin flip pairs JJ-88 (3% of total) and we’re far behind the rest 40% of the time. All in all, a clear fold. b) VPIP=34 / PFR=31, same in all positions. Loose-aggressive maniac who raises all the time. We are crushing his range, so we’ll definitely play – the only question is, should we re-raise? We have a drawing hand in position against an aggressive player and that’s an incentive to simply call and try to trap. However we probably have the best hand right now so it’s also correct to isolate him by re-raising and not let the blinds in cheaply. When deciding consider the additional traits of the raiser – some maniacs give up in the face of strong opposition and if so, a big re-raise could win the pot outright. c) VPIP=11 / PFR=8, positionally aware with PFR=6 in MP. A very tight, aggressive player raises in middle position and you should fold your AQ. Notice that this situation is identical to the first example, even though the VPIPs are starkly different. Many players who use HUDs still make the error of folding to the tight player and calling the one in example A, while thinking ”wow, he’s so loose”. But the villain in the first example actually raised and his VPIP alone is irrelevant!